Hello! Recently, Musse & Cloud sent me a few pairs of shoes from their summer 2016 collection and I could not be any more in love. These heeled sandals rival the comfort of any other shoes in my closet. For this look, I styled the heels with an elegant black skirt and black tank top. I love the simplicity yet charm of this look. I accessorized with a leopard print, cross-body bag, funky cat-eye sunglasses and a choker necklace. Bold red lipstick put the finishing touch on this look. Hello! I recently added this stunning green romper to my wardrobe and I'm already obsessed with it. What's not to love about it? I'm falling all over the rich green color, trendy lace up style and flirty breezy silhouette of the romper. 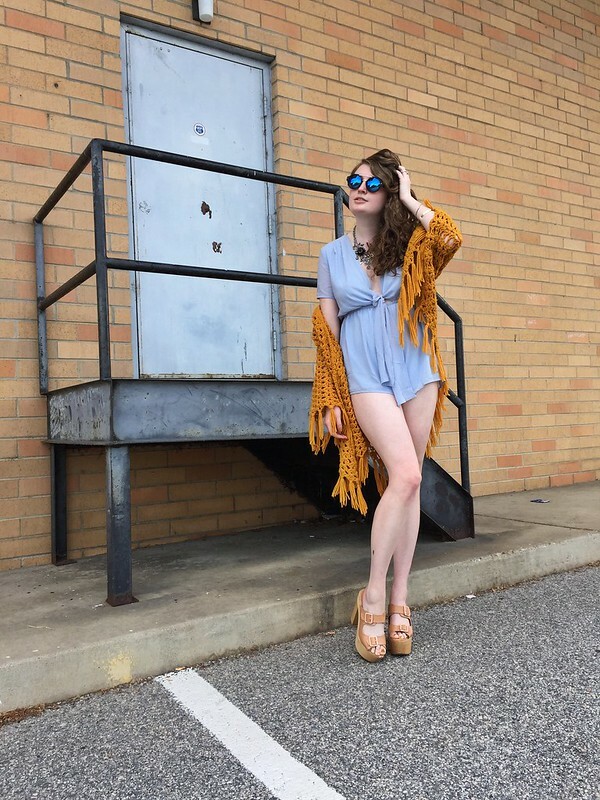 I scooped this romper up at Ashby in Richmond for less than $20- score! For this look, I decided to create sort of a sophisticated chic French mood with the romper. 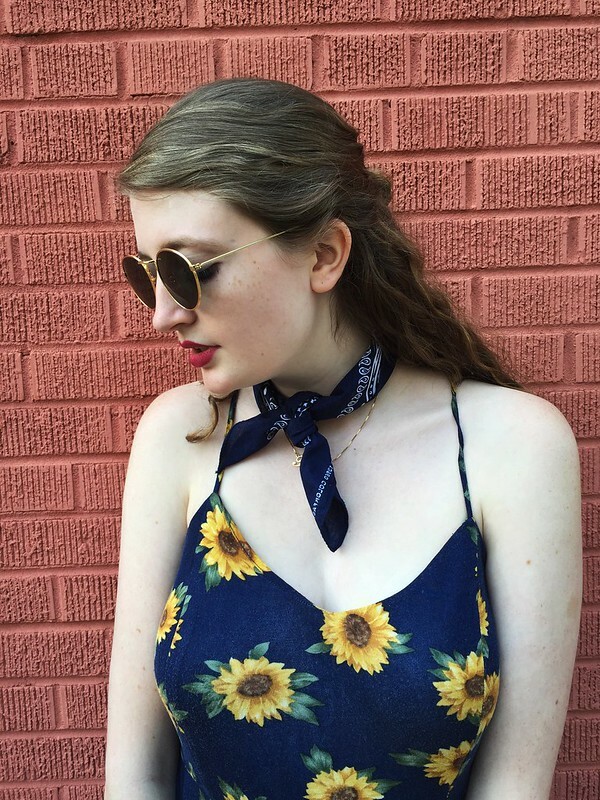 I styled the romper with a classic pair of Givenchy sunglasses, brown Coach bag and vintage neck scarf. 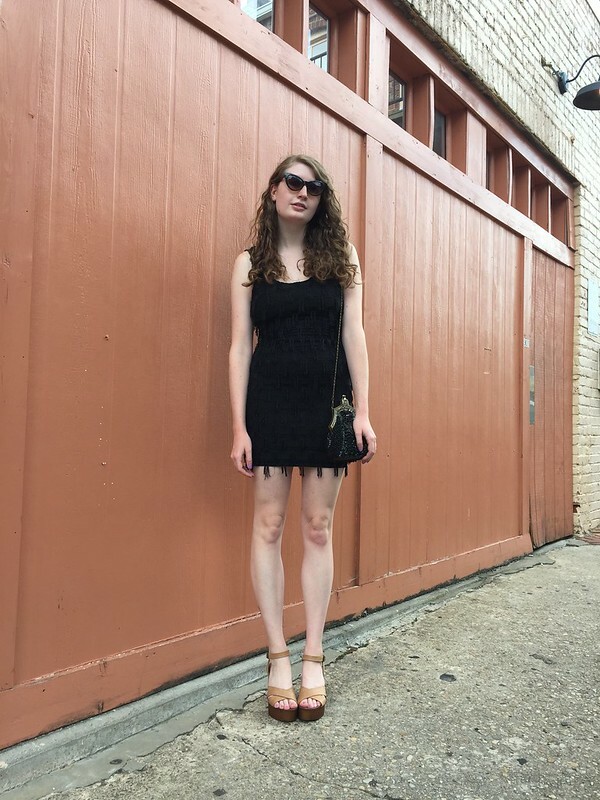 I played off the lace-up detailing of the romper by pairing it with a pair of brown lace up wedges. For this look, I decided to accentuate the baby blue of the romper with various shades of yellow. I started by slipping on a mustard-yellow, knit shawl followed by the cutest pair of platform heels. I accessorized with several pieces of golden jewelry including the coolest "under the sea" necklace. A pair of trendy reflective sunglasses pulled the look together. Hello! I'm pretty confident that I was born in the wrong decade. Actually, I'm completely positive that I was born into the wrong decade (even as much as I love you, dear internet!) I'd be incredibly content if it was 1966 right now instead of 2016. But as time travel does not currently exist, I'll stick to traveling back to the sixties through the way that I dress. 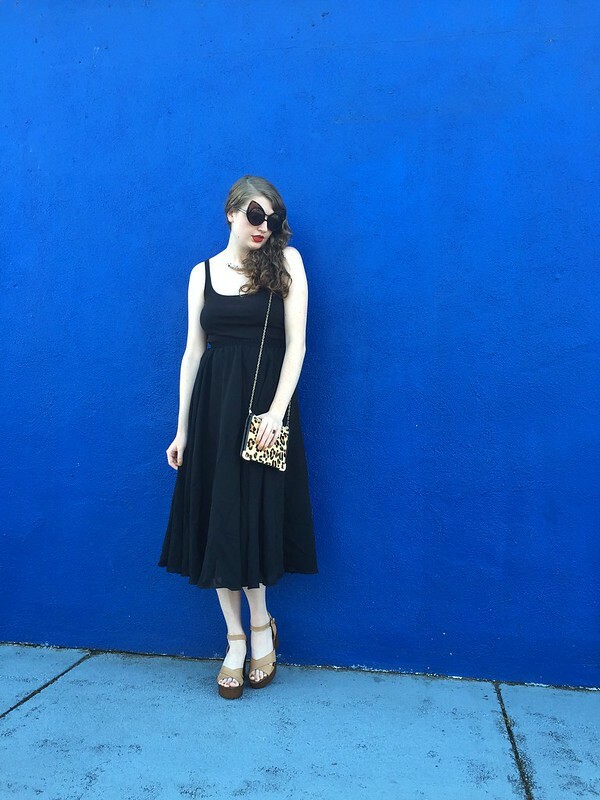 Recently, I added the two most wonderful vintage, sixties-esque pieces to my wardrobe: the funky white shoes and vibrant dress that I'm wearing in the photos above. I spotted this dress last week at Rumors and knew that I needed it in my wardrobe. The bold colors, trippy print and vintage appeal of the dress are absolutely irresistable. 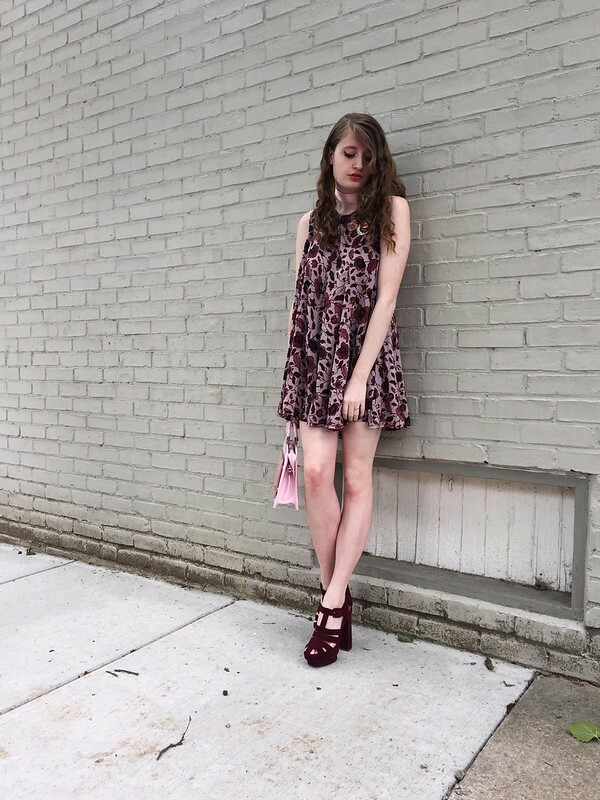 This dress was a steal at around $15 and even better yet, I had store credit that I was able to use to make the purchase. While the dress was definitely a great purchase, the shoes were an even better purchase. I spotted these beauties at Diversity Thrift last week as well and immediately fell in love with them. The funky shape is unlike anything that I've ever seen before. They're so mod that it's almost ridiculous. Like could they be any cooler? However, they were completely beat up and covered in scuff marks when I spied them. But I had never seen any shoes like them before and for just $4, I decided to purchase them and attempt to clean them up as well as possible. Luckily with the help of a little olive oil and nail polish remover, I was able to have these shoes looking great in no time. It was a no-brainer to pair the two purchases together for a distinctly sixties look. 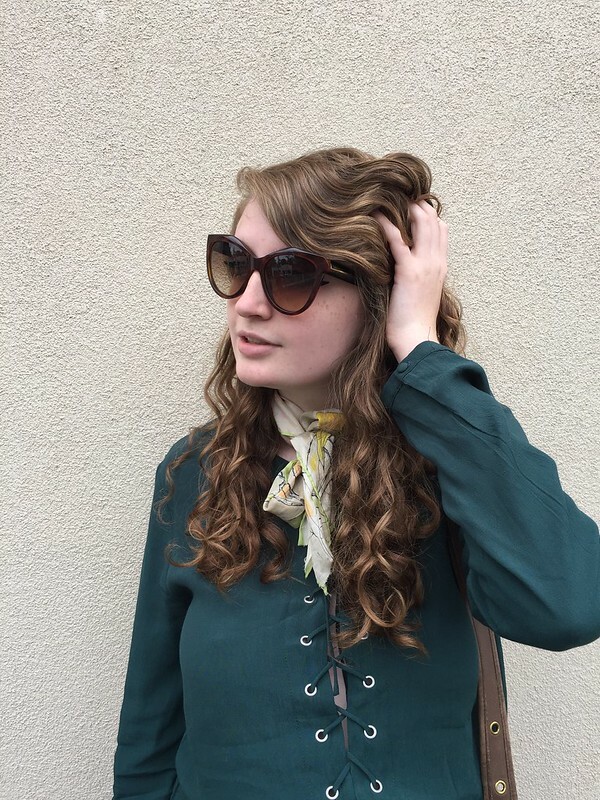 I added to the retro essence of the look with a vintage purse and rad cat-eye sunglasses. A swipe of lipstick accentuated the vibrant colors of the dress. Hello! There are certain items in my wardrobe that I'm fairly confident will practically never leave my wardrobe and this vibrant floral romper is certainly one of them. 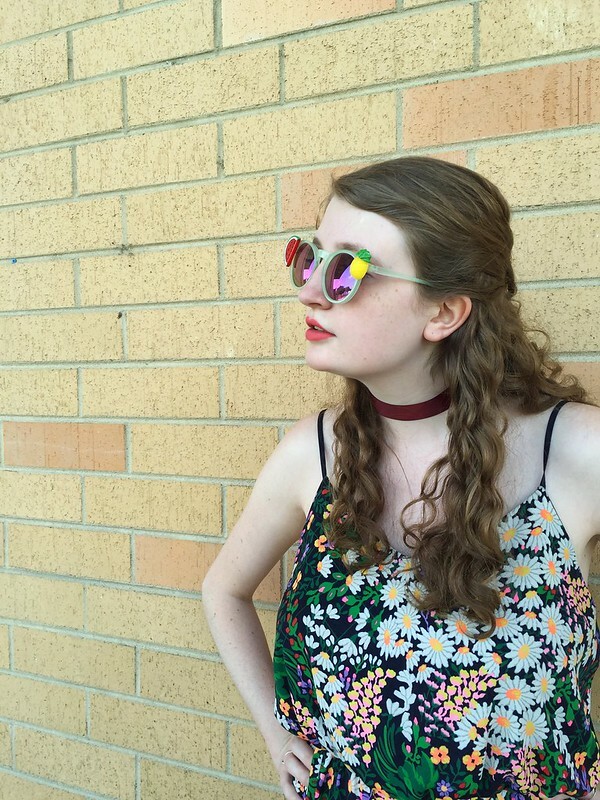 This romper entered my wardrobe (and my heart) a couple years ago and has since then been a warm weather go-to. The vibrant colors, cheery print, lightweight material and simple silhouette make it impossible to resist once the weather starts creeping into the high eighties. For this look, I wanted to play around with color to highlight the vibrance of the romper. 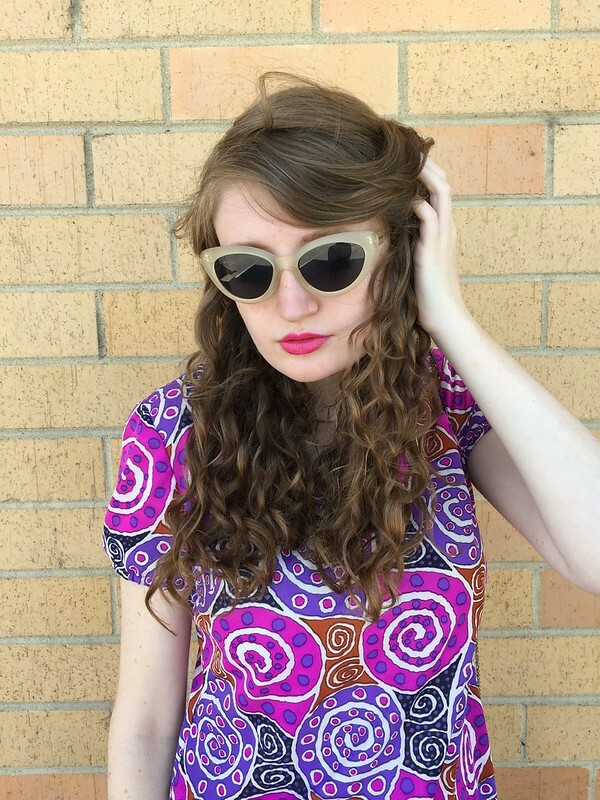 I started by donning a fun pair of fruity sunglasses that I snatched up this past season at GoJane for just $5. What says summer better than a pair of sunglasses adorned with watermelon and pineapple charms? 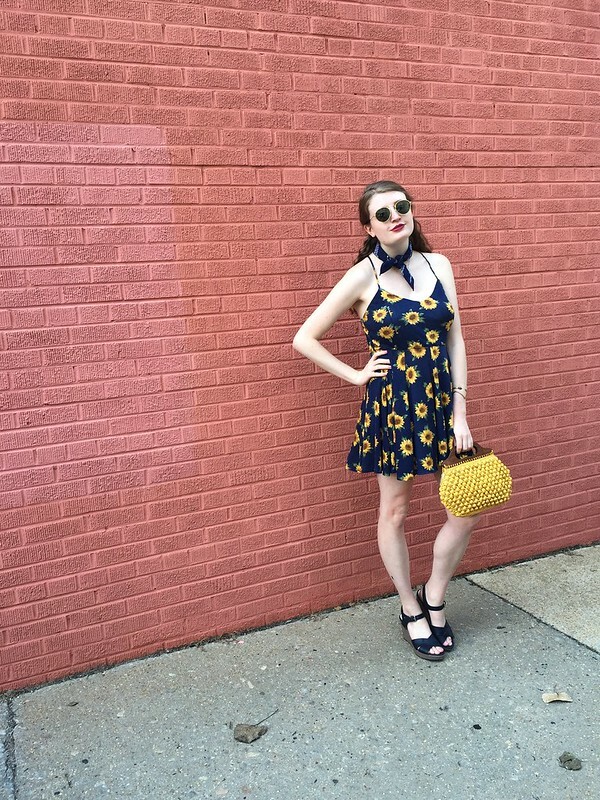 I grabbed my vintage yellow purse to accentuate the yellow of the romper as well as the sunglasses. I also accessorized with several golden rings, golden bracelets and a burgundy ribbon worn as a choker. I emphasized the burgundy color of the ribbon by also slipping into a pair of burgundy platform heels. A happy shade of peachy lipstick pulled the look together. Hello! Recently, ONNO sent me one of their bamboo t-shirts and by far it's the softest shirt that I've ever owned. This is their "vintage pink" bamboo t-shirt and it retails for $29 with free shipping in the USA. ONNO sells a variety of different sustainable t-shirts for men and women, all made from bamboo, hemp and organic cotton. ONNO focuses on sustainability and giving back; they have several green initiatives as well as a pledge to responsible manufacturing. What's not to love about that? 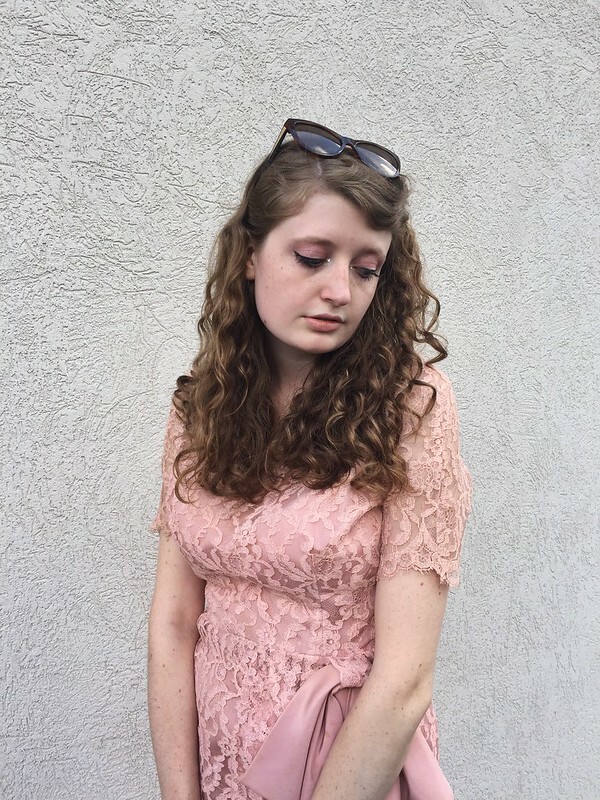 Besides loving the sustainability behind my ONNO t-shirt, I'm head over heels in love with the rosy pink color. For this look, I highlighted the vintage pink color of the tee by pairing it with a pair of warm-colored floral shorts. 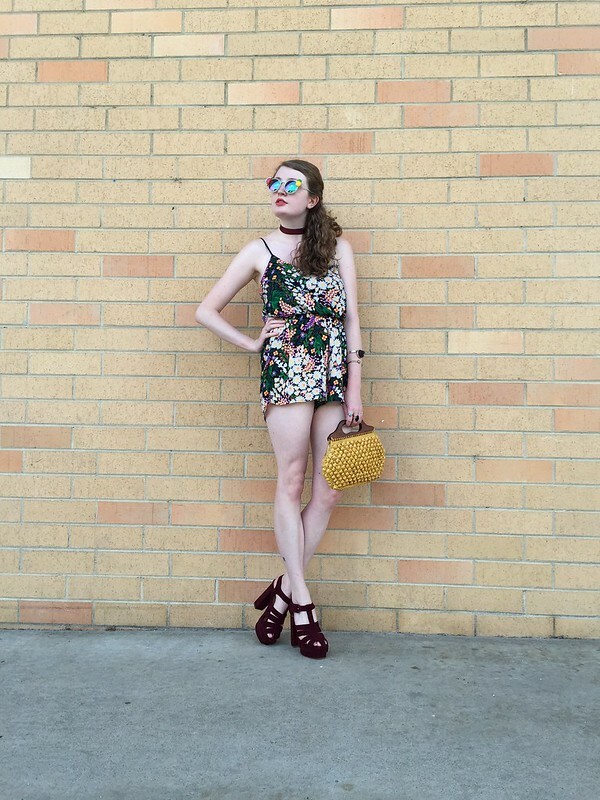 I accessorized with a vintage beaded bag, several pieces of golden jewelry and a statement pair of cat-eye shades. Neutral platform heels and peachy lipstick pulled the look together. Hello! Who would have ever thought that I would be so in love with the color pink? In the past, I've shied away from the color pink but this season, I'm all about it! I love the femininity and softness of the color. 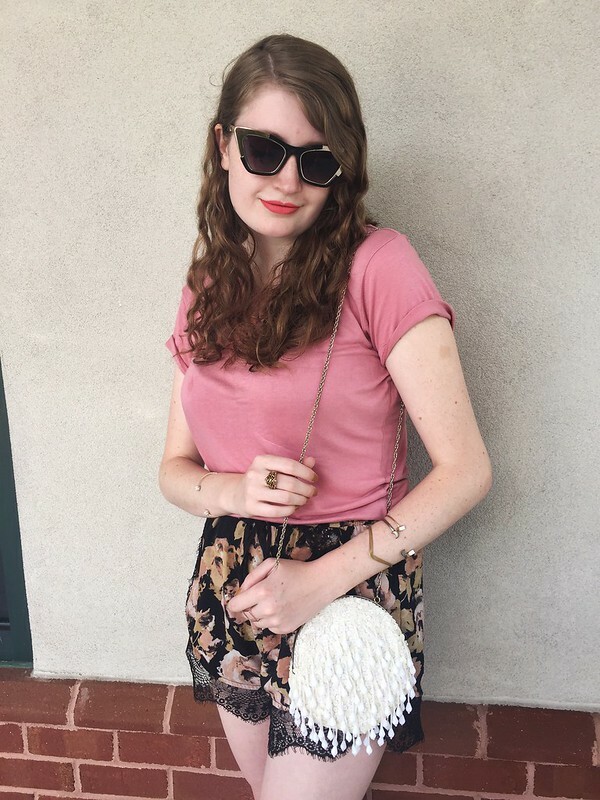 For this look, I brought out one of my favorite pink-colored items in my wardrobe, this vintage pink purse. Recently, my sister gave me this purse as a graduation gift and I can't get enough of it. 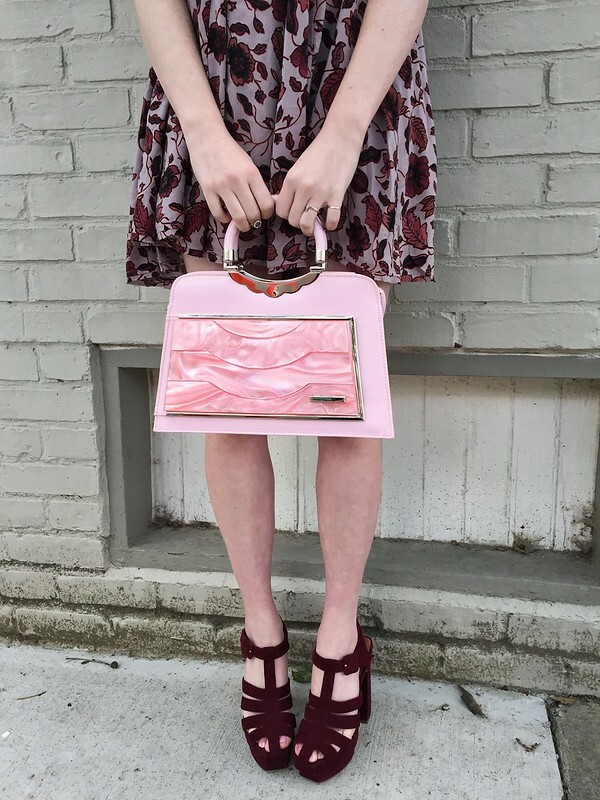 The retro appeal, pink color and unique boxy shape of the purse all have me head over heels in love with it. For this look, I decided to emphasize the color and retro appeal of the purse. 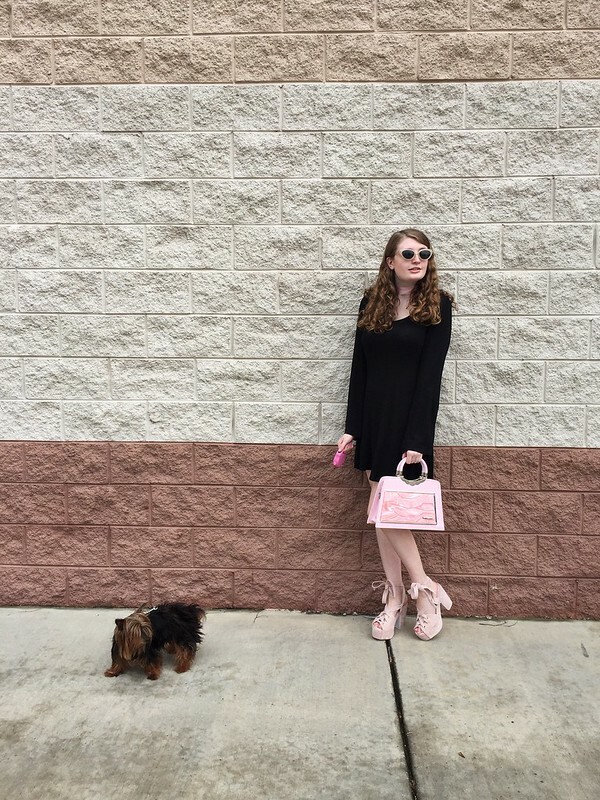 I paired the purse with a retro floral dress in warm colors that perfectly complemented the pink color of the purse. Then, I slipped on a pair of burgundy platform heels to draw out the hints of burgundy in the dress. I accessorized with several rings and vintage pins. 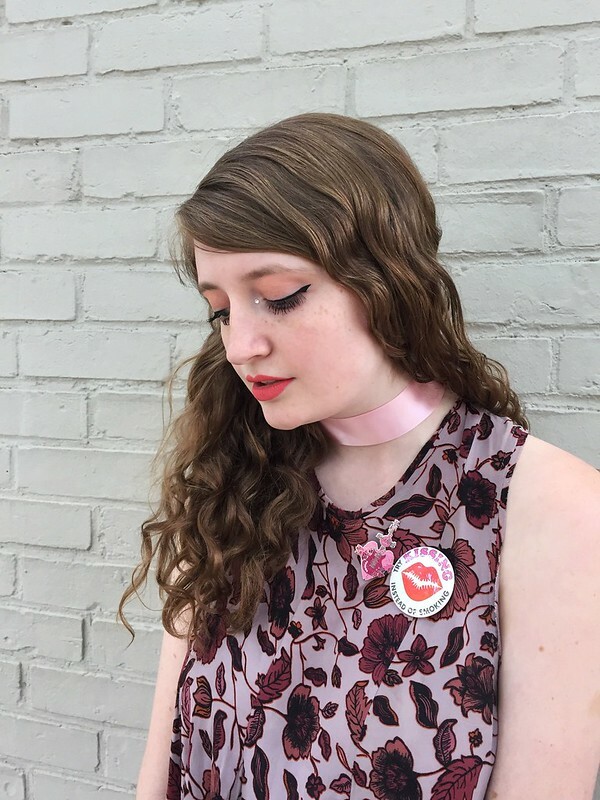 I also played around with the choker trend by tying a light pink ribbon around my neck. Peachy colored makeup pulled the look together.